Full sun to partial afternoon shade in warm climates. Very slight. Established plants in a sheltered location can sometimes survive winter in mild climates. Mix a standard application of a balanced organic fertilizer into the soil prior to planting. In midsummer, drench plants with a liquid plant food to stimulate new growth. Salpiglossis stems are not very stiff, so the plants often benefit from staking. Most varieties produce intricately veined, bicolored flowers. A mixture of colors is fun to grow and lets you experiment with this comely flower. 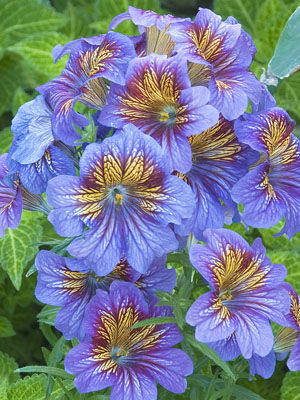 Salpiglossis does not do well in very hot, humid weather. It grows best in climates with cool nights.